Every other year, more than 100,000 metalworking professionals worldwide flock to Chicago for the International Manufacturing Technology Trade Show (IMTS). They’ll do so again September 10-15 as IMTS 2018, the country’s largest manufacturing tradeshow with more than 1.3-million sq. ft. of exhibit space, takes over McCormick Place in downtown Chicago, IL. The 32nd edition of the show, produced by AMT—The Association for Manufacturing Technology, will focus on five leading manufacturing industries: aerospace, automotive, medical, machine shop and power generation. Attendees can discover more than 15,000 product and service innovations from more than 2400 exhibitors, encompassing machine tools, controls, computers, software, components, systems and processes. This year, for the first time, IMTS will run in conjunction with the Hannover Messe trade show, the world’s leading trade show for industrial technology. Hannover Messe, held annually in Hannover, Germany, draws manufacturing-industry leaders from all over the world. Hannover Messe USA debuts as the pursuit of international partners becomes ever more important in the market. “We now want to leverage the power of the Hannover Messe brand to speed up growth in our foreign markets,” says Deutsche Messe managing board chairman Dr. Jochen Köckler, describing the show’s co-location with IMTS. Specific industries, technologies and solutions will be grouped under 10 IMTS pavilions at the show. The groupings consist of abrasive machining/sawing/ finishing, additive manufacturing (AM), controls and CAD/CAM, EDM, fabricating and lasers, gear generation, metal cutting, machine components/ cleaning/environmental, quality assurance, and tooling and workholding systems. The Next Step: Taking 3D Printing from Prototyping to the Production Floor. Ramon Pastor, vice president and general manager of HP 3D Multi Jet Fusion Business, HP Inc., and Joe Gemma, president and chief executive officer of Kuka Robotics Corp., discuss overcoming obstacles to AM and supporting the transition from manufacturing prototypes to finished products. Maximizing Manufacturing Productivity in the Information Age. Dan Skulan, general manager of the industrial metrology group at Renishaw Inc., describes techniques and tools that increase the productivity of manufacturing operations. Redefining the Future of Manufacturing with Metal 3D Printing. Jonah Myerberg, chief technology officer of Desktop Metal, discusses the future of 3D metal printing, and the kind of game-changing advances that will turn manufacturing on its head. Process Monitoring and Control in Metal 3D Printing: How to Tame the Tiger. Dr. Richard Grylls, technical director at SLM Solutions N.A., leads a talk on how recent developments in laser-power and metal-pool monitoring can be used to monitor and document production processes for transparency and repeatability. Metal Additive Manufacturing Myths: The Truth About Powder Reuse and Its Effect on Mechanical Properties. Andrew Carter, processing and manufacturing engineer at Stratasys Direct Manufacturing, discusses research conducted by Stratasys showing that the reuse of AM powder is a viable and economical option for production. AM Is Not Just for Rapid Prototyping Anymore. Dr. Greg Hyatt, senior vice president and chief technology officer at DMG Mori reviews strategies and specific examples from Virgin Galactic and NASA that show how these AM solutions allow for ideas that previously were impossible to manufacture. Selective Laser Sintering (SLS): Additive Manufacturing with Polymers Is Closer Than You Think. Donnie Vanelli, chief operating officer of EOS North America, discusses key factors in new material development, specific advances in hardware and software and resulting examples of cost-per-part achievements in polymer SLS manufacturing. Opening Up Design Freedom and Mass Customization Through 3D Printed Lattices. Phil Desimone, vice president of business development at Carbon Inc., describes how printing complex geometric structures can open up design possibilities for AM, such as in the 3D-printed, lattice-structure sole of the Adidas Futurecraft 4D shoe. Attendees can register for several conference sessions throughout the show, including the IMTS Conference, which comprises nearly 70 55-min. 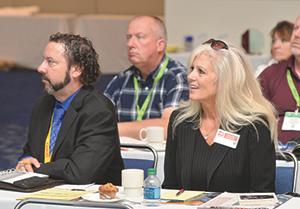 educational sessions offering tangible insights from experts within the IMTS exhibitor community. A one-day IMTS Conference pass costs $275, a four-day pass is $475 and conference registration includes exhibit-hall access for all six days of the show. As it reaches the mainstream in manufacturing circles, AM makes a splash at IMTS 2018. The show’s AM Emerging Technology Center will wow and inspire visitors with demonstrations and insights into how the field is growing to better serve projects big and small. In 2014, the world’s first AM-produced vehicle was built at IMTS. “To obtain a true sense of what is possible today and in the future, IMTS 2018 offers an unprecedented concentration of AM resources,” says Peter R. Eelman, vice president of exhibitions and business development for AMT. The IMTS conference schedule includes numerous presentations related to AM. See the AM Conference Offerings sidebar for details on some of these presentations. In addition, the co-located Additive Manufacturing Conference, presented by Gardner Business Media, will be held September 11-12. Dedicated to additive technologies for industrial-part production, this conference covers multi-jet fusion, safety, materials, large-scale 3D printing, and the combination of additive and subtractive manufacturing. While featuring the latest here and now in AM, along with other part-production technologies, IMTS 2018 also looks to the future via its Student Smart Summit. The summit will promote the manufacturing industry to prospective students from elementary to post-secondary institutions through hands-on displays, challenges and learning labs. Students can experience interesting aspects of metalworking along with the latest technology in robotics, machining and AM. Among the activities offered to students: the Rippl3D.com 3D-printed air-rocket challenge, where they can design and print their own model rocket to test in a special flight-test silo.